Should you switch to the Salesforce industry? Preface: this post is part of the Salesforce Careers series. Thinking about building your career on Salesforce? Heard good things about the industry, but not sure if it’s still a good time to switch? Are you an experienced professional coming from another industry like SAP, .NET, Siebel, etc? …well I know you’re out there and this post is for you! …I must say that Salesforce is the hottest industry you or I will experience in our lifetime. Period! You really have to be crazy not to go all in here. I consider myself lucky to have lucked into Salesforce, and, now that you’re reading this post, consider yourself lucky too! 1. There are a TON of job openings. More jobs than professionals! Job openings are growing at 58% per year for Salesforce developers! Salesforce developers get multiple recruiters reaching out to them every single day. If you don’t believe me, try changing your job title to “Salesforce Developer” on LinkedIn, add the Platform Developer I/II certification to your profile, and join a few Salesforce developer groups on LinkedIn. Sit back, and watch the flood of recruiters attempt to court you. Glorious! The supply and demand curves are so broken here that even great companies like Google have a difficult time finding Salesforce developers to hire. Join the Salesforce world, learn to code, and never have to worry about finding a job again. 2. Salesforce professionals make way too much money! The average Salesforce developer makes a $130,000 per year base salary. Hourly and remote wages range from $80 – $150 per hour. And, like I mentioned earlier, there are a ton of companies begging to hire you! I personally know Salesforce developers making over $400k per year. Yup, you can make CEO level salaries from coding in Salesforce! The Salesforce Ohana is the most giving and helpful community you’ll ever experience! 4. Skills from other industries are welcome! The Salesforce world is huge. You end up working closely with teams in sales, marketing, support, engineering, product, legal, executives, etc etc. 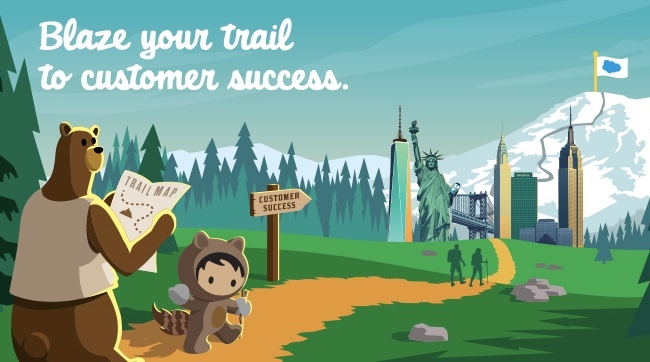 No matter where your experience lies, there’s something in your background that’ll help you excel in the Salesforce world. No one has more of a right to Salesforce than anyone else. It’s not like there’s a Salesforce major in college that exists! Yup, even people with crazy backgrounds such as bartenders, violinists, historians, and cashiers will find success in the Salesforce world. And if you don’t believe me, check out the Success Stories page to read 40+ inspiring stories of people finding unexpected success in the Salesforce world. Who knows, maybe your story will be on that page one day! 5. Salesforce is here to stay. If I bought Salesforce stock when I started in this industry, I’d be retired now! I’ve been in this industry for nearly 10 years and I still don’t know who’s in second place. No other company has come even close to threatening Salesforce in the CRM game of thrones. I don’t expect this to change for at least 5 years either. And I’m only using 5 years as a time frame because predicting anything further than that is impossible. 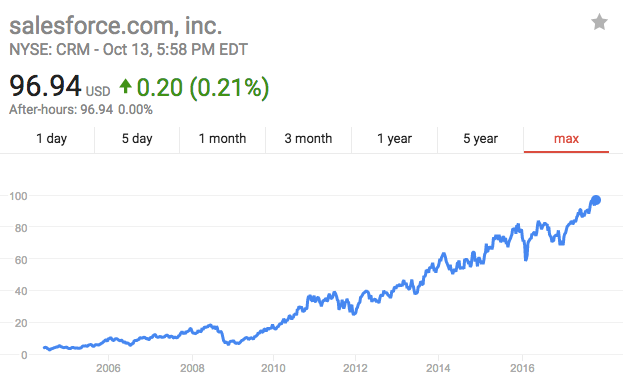 Let’s say for the sake of argument that in 5 years another company comes around and makes a better CRM product. Well, as someone who implements Salesforce for many different companies and teams, I can say with certainty it’d be nearly impossible to convince teams to switch CRMs. Salesforce is just so engrained into a company’s day to day operations. And well, should Salesforce ever fall into second place, who other than you would be best positioned to learn the next great CRM product? Long story short, Salesforce is one of the most lucrative yet safest industries to switch to. If you’re on the fence, stop waiting around and start taking the next steps towards making the best decision of your life. Learn Salesforce. And don’t forget to thank me later for it. You really have to be crazy to choose anything else. Thanks for posting this. I agree, Salesforce is on fire. I am a Siebel developer with over 20 years of experience. You are right – there are more opportunities than candidates – a lot more! Here’s the hard part, though. EVERYONE wants experience! I have the Admin and Platform App Builder certifications. Over 20 years of CRM – STILL, nobody wants to hire me without hands-on Salesforce experience. I’ve been told this by many recruiters. I’m sure I will find one, but it is VERY hard! I have 5+ years of experience in software development with Java, Front end development technologies like JS, AngularJS, Angular, HTML5 etc. I want to change my career in Salesforece developer. Please suggest if my current work experience would create problem. And will i be considered as a fresher? Thanks David for the post. I am a Siebel Admin since the last 4 years. Looking at the current scenario I am planning to switch to Salesforce. Could you please let me know the feasibility of learning and switching from Siebel to Salesforce. 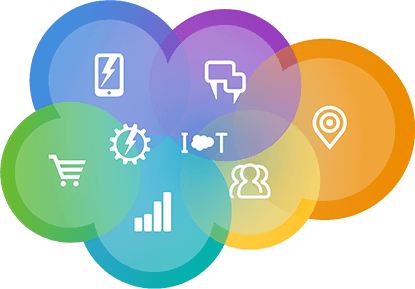 Would my 4 years of Siebel and 0 years of Salesforce experience come in my way of attracting a better job opportunity in Salesforce world? I have been working in SharePoint for last 10 years and started exploring sales-force to gain knowledge of CRM world, Is it even feasible to completely shift to SalesForce after so much exp in previous tech? Any suggestion would be great help. For the past 10 years I have been working as a .NET developer and I’m comfortable doing the role.Few days back my employer asked me if I could take the role of a SF Administrator as the person who is doing role is leaving.Would you suggest it would be good for me to shift my current .NET developer role to SF Administrator role. My concern is I have 0 exp in SF, also which role would be ideal for SF Administrator or SF developer. Many people here would give anything to have the opportunity that you do! Go the dev route. 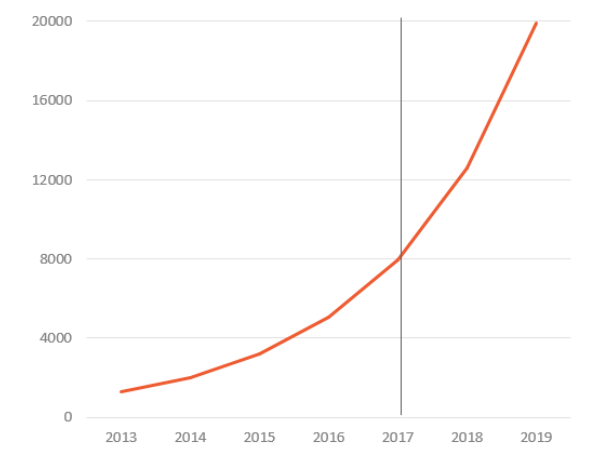 .NET development is slowing down. Salesforce isn’t! Hi, i am shamu, i completed my Bcom graduation. i have 2 years of experience in other KPO . i am planning to shift in developer side. so please suggest me is Sales force will be good for my career to grow. I am working as a manual tester.I completed my graduation in Electronics and Communication Engineering. I have no knowledge in Programming language. But I want to go for Salesforce Developer.Is it good to opt it. How much Programming required to learn salesforce. 0 experience required! Go get it! I’m so grateful to have happened upon your article! I was a teacher in my previous life, & after a few years off being a full-time mom I’m looking to use my skills in a new way. A few weeks ago a family member tipped me off about SF & I’ve been working through trails ever since. I’ve been worried that there won’t be an opportunity for me without experience or a business/ IT degree, but you have set my mind at ease. I really appreciate the resources you’ve given here. I’m going to follow your advice 100% & thank you in advance! And if you have any other advice for me specifically, I’d be so grateful! Thank you Diane good luck in your journey!! Definitely check out your local Salesforce user groups! I have no experience in coding, and I have a gap of 5 years in my career, can I get a job in Salesforce if I do the certification. Yup, read every word here! In training programmes, you have mentioned Mavensmate as the best coding platform and I am getting used to it. Also, I see that Mavensmate is no longer supported and would like to know your comments on it. Do you recommend any alternatives to it? I am currently heavily dependant on Mavensmate and standard console. I am disappointed with the lack of support for Mavensmate and I believe the sooner the better to switch to Eclipse. What a writeup David! This article pumped me up to pursue my career in Salesforce. Let’s do it. Now or never ! Would it make sense to move from Mainframes technology to Salesforce. Have around 10 years of exp and really looking forward to move to Salesforce. What are the job responsibilities of Consultants in Salesforce and how to become zero to hero. I mean whats the Path for an Okish Developer in Salesforce? Hi David, I’m 49 yr old out-of-work programmer (most recently .NET/C#). I’ve spent the last 2 months unsuccessfully looking for a job. I’ve spent a lot of time on PluralSight trying to sharpen my skills on you name it: Web API, Angular, Node.js, etc. This is where I first came across you and your Salesforce offerings there. You talk about all the great Salesforce opportunities in your PS courses but I guess that wasn’t enough. Then this morning I read your SF99 article “Should you switch to the Salesforce industry?” and a lightbulb went off. I need to reinvent myself. I need to set myself apart from the sea of programmers out there. I need to know Salesforce and the Apex programming language. So I’m in, lock, stock, and barrel. You said in you article “don’t forget to thank me later for it”, well I’d like to thank you right now because I haven’t felt this pumped about learning something new in quite a while. Smart choice. =). I agree 100% and followed that path as well! Now is the time to either switch or take our SF skills to the next level.